I really like ladders. I have a couple but I want more. I would love to have one like this. Look close, see the one with the spring like rungs? Cool. 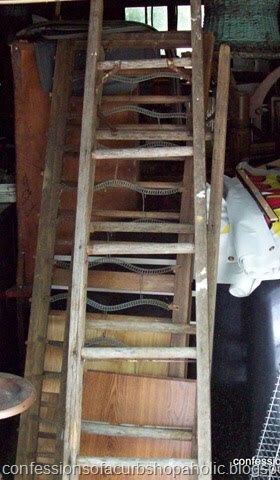 So, I really wanted to participate in Donna's Saturday Night Special "ladder" theme party over at Funky Junk Interiors because I like ladders too! 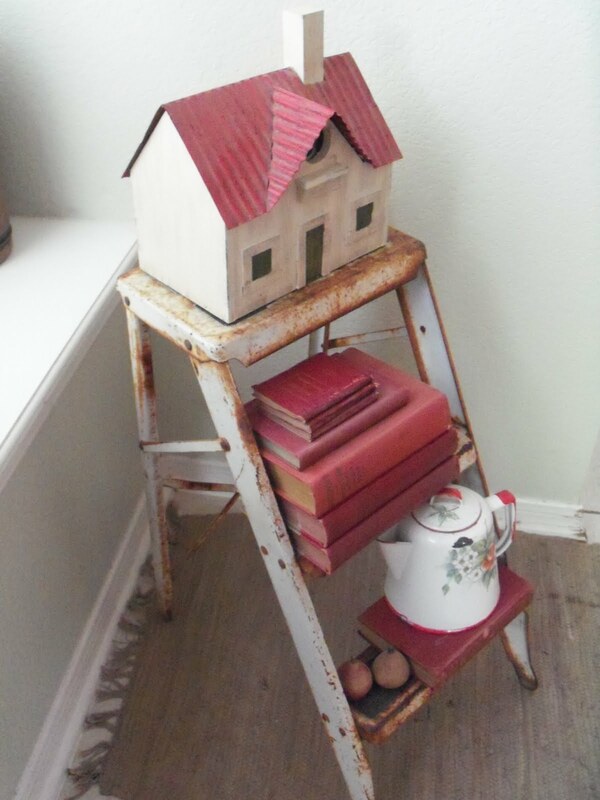 I knew I had a great little ladder to bring but I had to find it because we are moving things around in our little cottage and the cute little ladder was "taking a break." Here's my little white wooden one but that's not the one I'm looking for...and I'm certainly not looking for the huge silver extension ladder. This one is kinda cute but it's not the one either. I like the old galvanized detail so maybe one day I'll paint this little cutie but for now, we still use this as a real stepladder. So, where is that other cute one I really want to use? Oh, I think I see it! There it is, right there...in this really bad picture because I'm such a bad photographer. I like the rusty and actually it is a very pale bluish white. Now, of course to take it to the party, it needs a little something. Since my favorite color is red, I think I'll add some of my favorite red things. That's better! Love a little red around my cottage. See that cute little birdhouse with the metal red roof? Target. Yep, Got it at Target last year on sale for less than 10 bucks. Love that. 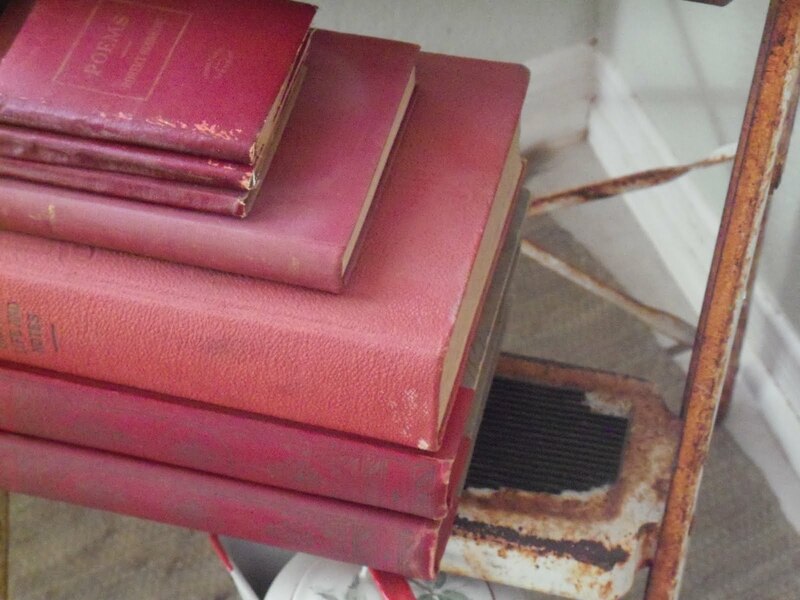 Little ladders make great bookshelves...especially for old red books! This sweet porcelain teapot (cause I only drink tea!) was painted by my grandmother. It's one of my favorite things! There are some of those wooden tops from my father-in-law's childhood that I keep moving all over the house. I wish I had about 20 more of those! 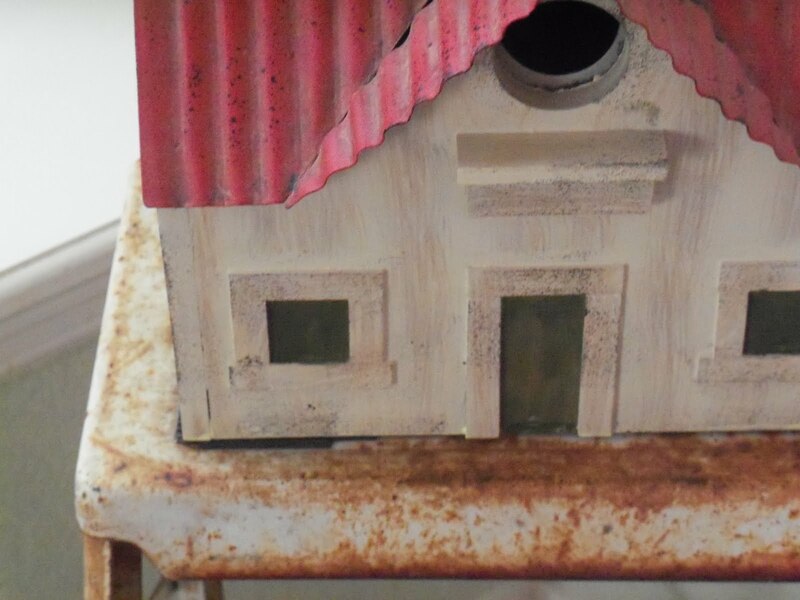 You got the birdhouse for less than $10?! I don't think all Target stores are created equal. Oh how cute! It remind me of my dad's growing up. Only his was green. I wonder whatever happened to it? 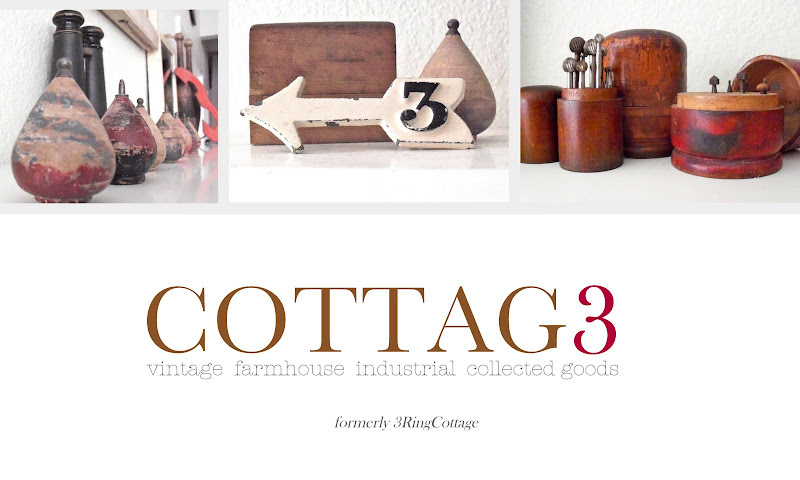 Yours is great, especially with that red birdhouse on it! Cute ladder and accessories. And of course I love all the red. That is adorable, Gina! I love ladders too. Where do people get those awesome things? sooo cute. 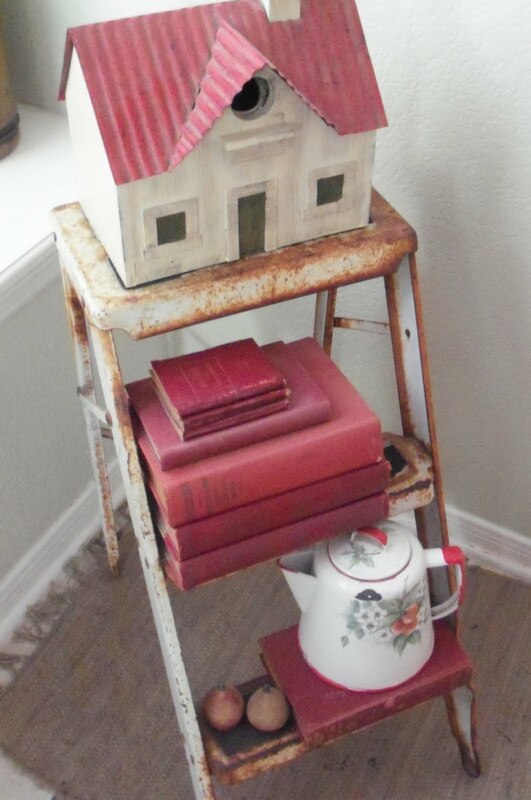 Love the 'old' red...not too bright, love the muted shades... very cute, glad you found the ladder you were looking for and fixed her up so we could all see her. Notice how I figured out it was a girl... because it's so petite! Oh I absolutely love this one! It is so sweet, pretty, cheerful and perfect! It looks like it's right out of a magazine - did you say you're a bad photographer? I love the photos - really! What a pretty and unique vignette you put together. The red definitely pops, and what cool red accents you have. I just got a cute little ladder at an auction, you have inspired me to get it out and find room for it. Now if only I had a stack of red books. What a great collection of ladders you have? How funny it is that some people can't see the beauty in something faded, rusty and paint chipping off...truly beautiful! Oh my. As a true rust lover, I wasn't sure about using that ladder. I was dead wrong. The rust is now enhanced! So adorable! What a darling little ladder! You are a WONDERFUL photographer, and that ladder is adorable! Who says rust needs to be sanded away??!! It looks great, Gina! Wow! I would have never thought a ladder could have so much potential! I might have to start throwing away my spouse's bike collection so that I can make room to start a ladder collection! Nothing but a whole lot of sweetness going on in your ladder corner with all that red! I'd say leave the rust alone. I laughed out loud when I read that - I'm afraid that is exactly what I was thinking. That being said I love how you styled it with all the red and white things, and especially the amazing tea pot that your grandmother painted. I love how your step stool came out! I'm a sucker for stepstools as well as ladders. I need to go accessorize some of mine now. The red is just adorable with the rusty white stool. BTW, I hate to tell you, but the spring ladder thing in the picture from my ladder post? That is actually the seat support for a futon. It just happened to be stored behind the ladder I was taking the pic of. Sorry to confuse you with that! 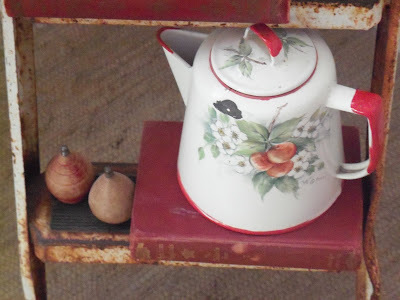 oh and BTW,the tea pot and tops are true treasures! I ADORE your little white and red ladder setup! (I LOVE when people use red, it's so spunky. But she and I just can't seem to come together!) BTW, I just realized that you said that your son just became a teenager. ( sending HUGS ) My girl/boy twins just turned 14 and I need some assistance from above!